It’s here! The game that has promised so much since the day I downloaded the demo on the Playstation Store! Motorstorm finally dropped through the letterbox from an eBay contact in Japan and my initial plays have confirmed that the PS3 now has its first title worth getting excited about! I love it to bits! The additional tracks and vehicles have turned it into a superb racing experience and the joy of tearing around in big trucks as well as on dirt bikes just has to be experienced. The additional tracks are so much sweeter as they offer a more ‘open’ racing environment with multiple routes through the canyons. Time the jumps right and you can take those nifty shortcuts around the canyon sides or simply mud-plug your way through the rut filled floor, whichever takes your fancy! The graphics are really nice, not anything the Xbox 360 couldn’t do, just very slick and detailed nonetheless. The splatters of mud and persistent ruts in the track just make it the best racing game I’ve played and normally I hate racing games! One of the more enjoyable things is being able to interact with fellow drivers if you are on your bike. As you drift by another rider you can give him the finger or even attempt to punch him off his ride! Superb. Control wise my many attempts at using the ‘Sixaxis’ motion control for steering inevitably resulted in me rapidly becoming mechanical detritus littering the landscape and try as I might I just can’t play the game this way. Motion control seems to have been tacked on just for the sake of it really and the only way to race is using the standard control sticks and buttons, such as they are. The major omission however is rumble. You really would appreciate a little controller feedback as you tear around the circuits and you seem to be left a little dead without that added vibration which would help you connect fully with the experience. I’m playing the Japanese version of the game (The PS3 is entirely Region free for games) of course as it has not yet been released to the US and will not appear in the UK until the console itself does (naturally). Once it does though the addition of online play will certainly make it a more rounded game and might make reading the menus and manual a darn site easier too! Also hitting the Sony Playstation Store pre-Christmas was the much touted Gran Turismo GT HD concept demo for free download. As yet I haven’t had much chance to put it through its paces but from what I have played it looks like a competent racer. 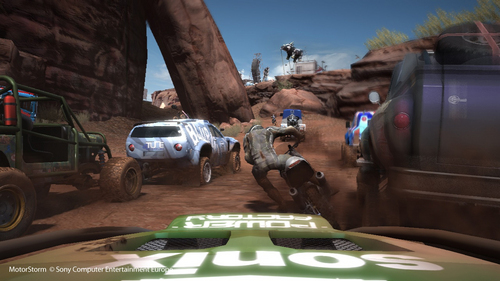 The download features one mountainside track and 10 cars which you unlock by completing time-trials. So far I have only unlocked a couple of cars (Racers are not my thing remember!) but it plays well and certainly looks and handles pretty nicely judging by my own limited experience. Whether I can be bothered taking time to go back and unlock more remains to be seen. So that just about sums up my Playstation 3 action for the past few weeks. Apart from downloading the inevitable update to Version 1.32 of the software of course. With the European launch nearly upon us I dread to think how many more times I’m going to have to download system updates before they finally decide enough is enough!